So those of us who tested on 23andMe before the whole kerfluffle with the FDA and access to health reports are finally seeing some action in transitioning our accounts over to the new 23andMe reporting system. This all began, you may recall, back in 2013 when 23andMe somehow managed not to fully cooperate with the FDA in getting approval for its health reports, after itself initiating the process to seek FDA approval.1 By the time the dust settled, 23andMe had had no choice but to suspend its health testing,2 leaving the genealogy part intact… but going nowhere. In the months since that big warning sign went up on older accounts, those of us who tested on the old system have been wondering just what was going to happen — and just how useful 23andMe would be for genealogical research once the transition was complete. Now, it seems, we’re about to find out. First, as far as the health-related information is concerned, we’re told that what 23andMe is going to do is archive our old health-related information in a PDF report. It’ll send us that report (or at least a link to that report) and that’s the only place that information is going to be available. And it’s only going to be available if we take some action in advance. 1. We need to answer some questions on our ethnicity — whether our ancestry is European or African, for example. That information is going to be permanently archived in a report and we won’t be able to change it after the archive is created. 2. We need to look at the existing health reports and see whether any of them are locked reports. Those who tested under the old system were analyzed for risks of things like Parkinson’s Disease or Alzheimer’s and the results are considered sensitive — meaning they’re things we may not really want to know. So we’re given the option: to look at that specific report, or to leave it locked. These locked reports are not available under the new system (since they don’t have FDA approval) so this is a now-or-never choice. If we don’t unlock it before our accounts are transitioned, we’ll never see the results. 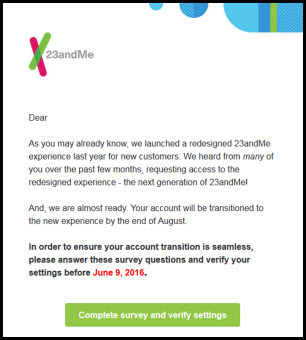 The emails have an action date — mine was 9 June 2016 — and a clickable link to the kit profile to make the needed changes, and of course anybody who tested under the old system who’s changed email addresses needs to log in to 23andMe and bring things up to date. Second, once these older accounts finally are transitioned, we’ll be able to see firsthand how much genealogical utility remains in the 23andMe system. It’s clear that some features useful to genealogists are going to be lost completely — Countries of Ancestry, for example, and the ability to see fully-identical regions (areas inherited identically from both parents, so the individuals are full siblings) versus half-identical regions (segments inherited from only one parent, which could reveal a half-sibling relationship). And, of course, the price tag — ouch. It’s a lot more expensive now at $199 so getting new matches may not be so easy. This only seems to apply to 23andMe customers in the US. The rest of the world is still in limbo. At least in the UK we had the health reports restored much earlier (December 2014) than you did, and we also get many more health reports than other countries which makes the test more worthwhile. The health reports in the US appear to be basically carrier status and traits tests, and many fewer than under the old testing system. I haven’t seen any of the international kits so am not sure what the differences are. I administer 2 accounts, but the instructions aren’t specific about multiple accounts. It’s most likely these choices have to be made for each account you administer. – Birth countries of a match’s four grandparents are shown in DNA Relatives and in the aggregate DNA Relatives download, but for all matches vs. just those opting in to Countries of Ancestry. Combined with the doubling of the number of matches default threshold shown in DNA Relatives, that information for more and closer matches will be given than under Countries of Ancestry. – The overlapping segment information is given for a DNA Relatives match if you’re sharing with that person or if the both of you have opted in to open sharing. Consequently, you can now tie together if that segment is relevant to a match with all four grandparents from the same country. – The new In-Common-With tool now also allows further information that had been included in Countries of Ancestry to be provided without betraying the privacy issues involved in Countries of Ancestry being removed. As I understood it, being able to see the segment information of the Country of Ancestry matches of a Countries of Ancestry match had been at issue. Privacy opt-in for the various tools across the site has been much better consolidated and simplified in the new experience, which will hopefully lead to a better understanding by customers. Good to know… provided that it actually does happen and provided that it’s available to those whose accounts are converted. Thanks. What if you tested after the date you mentioned. I was not able to load my 23andme results to FTdna as they said my platform was to new to be uploaded. Does that mean I’m eligible for what’s going on? We’re still waiting for word from 23andMe as to what (if anything) will be done with tests on the older chip platforms.